Last week I had a lot of computer work to do, so I decided to make it a little bit more fun by visiting some new (to me) coffee shops. 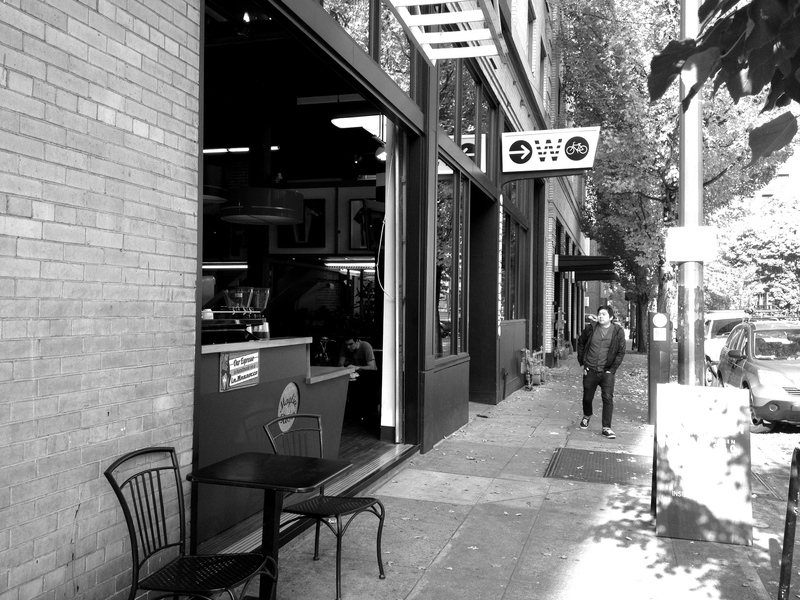 We have such a great coffee scene here, but I usually go to the cafe closest to me, Case Study Coffee. It’s a great place, but I want to expand my horizons. So I present to you… 5 coffee shops, 5 days, 5 quadrants. I’ve been to Barista’s downtown location before, which is very charming, but very small, so I thought I’d give the Alberta location a try. It’s in a new building across the street from Random Order Coffee Shop. 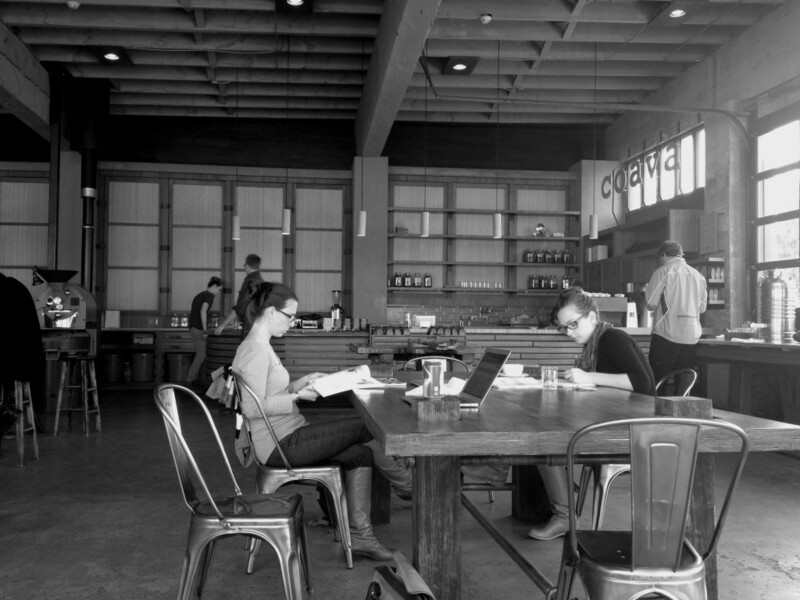 It is a nice, big space with plenty of tables, and seating along the coffee bar. 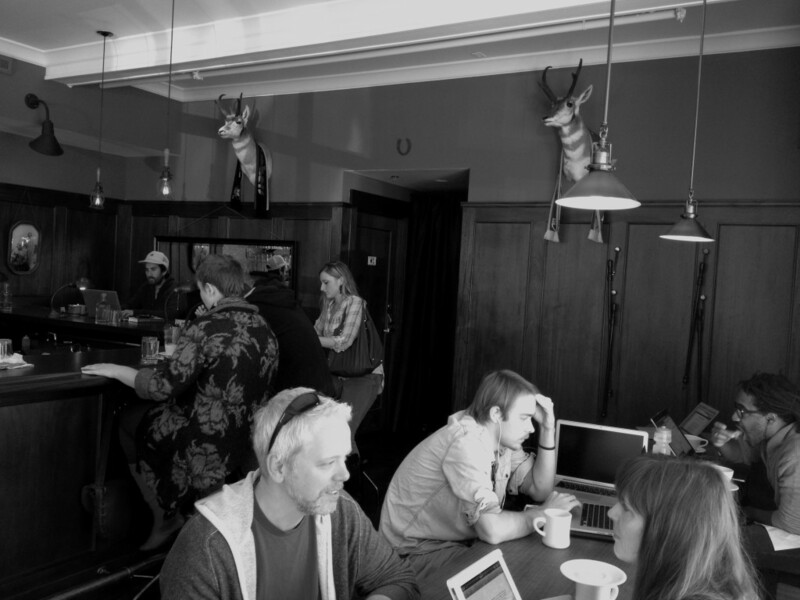 I loved the decor, with mounted animal heads on the wall it had a little bit of a library vibe. I ordered a drip coffee and cheese pretzel. The have pastries from Nuvrei, where they make excellent pretzels. Usually, I drink my coffee with cream, but this cup was so good, I skipped it! I wish I had asked more about what type it was. It was very busy and I was lucky to get a table, but eventually snagged a good one along the window. Overall… two thumps up. This was by far the best spot for actually getting some work done. It’s right across the street from the PCC Cascade campus, so it was quiet and filled with people studying. There were lots of tables and a few couch areas that even had plugs for your laptop (nice touch, it can be hard to find power sources sometimes). I was very happy to discover they sell pastries from my favorite bakery in town, Crema, so I ordered a coffee with a refill and a mushroom manchego biscuit. Another great find. I’d visit again. I was a little confused when I pulled up in front of Sterling Coffee thinking “this isn’t a coffee shop, it’s the M Bar!”. Turns out both are true. During the day the tiny little shop on NW 21st is a coffee shop, but by night, it’s the intimate M Bar. I left my laptop in the car for this stop since it’s so small. I’d feel bad taking up their valuable table space with my laptop and cords. I ordered a cup of coffee and bought a bag to take home. 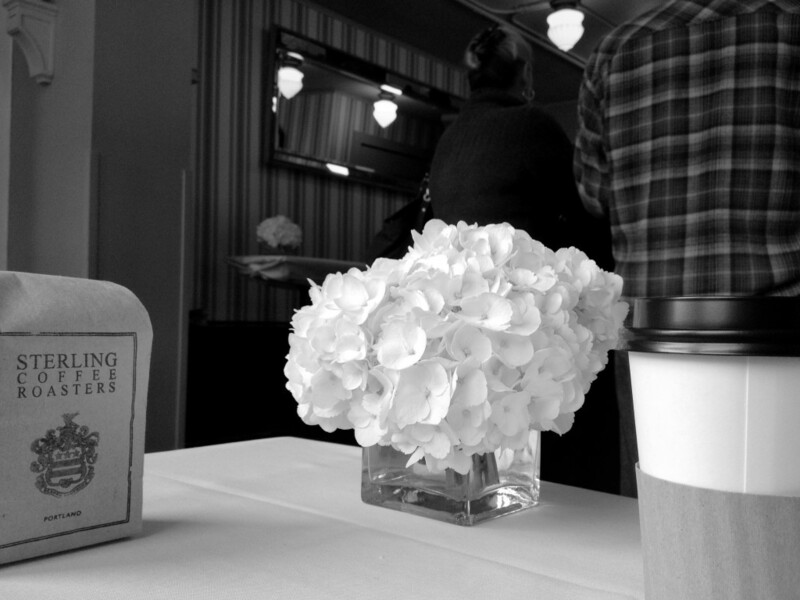 The space was beautiful and airy with white table cloths and fresh flowers on all the tables. I sat for 15 minutes to enjoy it and do a little reading. Sterling sells Bakeshop pastries which were hard to resist. They had a butter and salami baguette sandwich that was calling my name. I’d recommend this spot for meeting friends, not getting work done. This place won me over. I’ve actually been to this cafe before, just a run in/run out stop after I visited the Kidd Toy Museum (which is across the street). After that visit, I was kind of put off by this place. It’s at little….. pretentious. A little Portlandia. They brew each cup by hand in a Chemex, roast coffee in the middle of the store and share a space with a bamboo dealer. But this week, I gave it another try and really loved it. It’s amazing how a really friendly, welcoming service can totally change your feelings. Like Barista, they served Nuvrei pastries, so I got another pretzel. (What can I say, I’m kind of obsessed.) The coffee was excellent, nice body and flavor. I sat at a table for about 30 minutes writing on my Kindle and enjoying the space. Unlike all the other coffee shops I visited, this place was spacious and airy. My final stop of the week is Maglia Rosa. It was a sunny day, so I parked at work and walked across downtown to grab a cup. 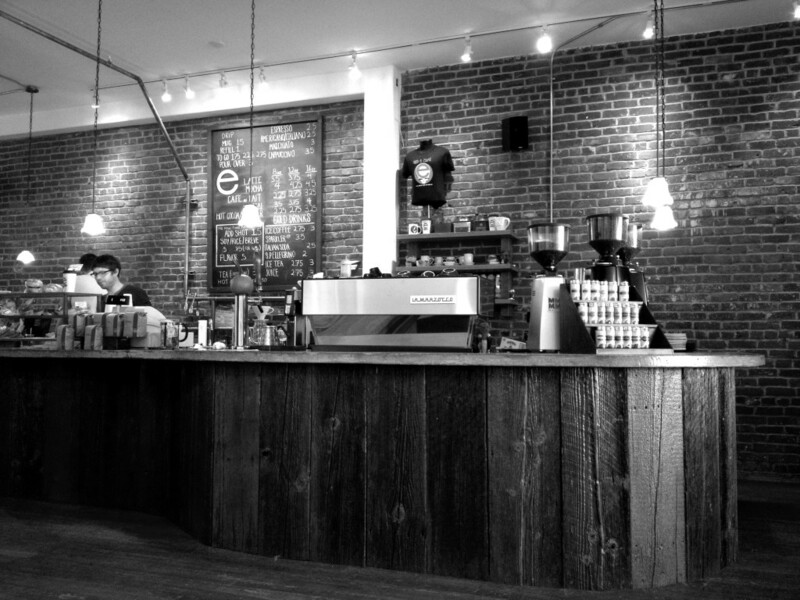 I’d read a lot of amazing reviews for this place, which is owned by a National Barista Champion. It took me a few minutes to find it because I did not realize it’s INSIDE a bike store. Very Portland. The cart sits in a hole in the side of the building. There is a small seating area behind it, but mostly, this is walk-up/bike-up service. She doesn’t even do brewed coffee, so I ordered an Americano. The service was fast and the espresso was excellent. If you’re in the West End/Powell’s Books area, go check it out.